The generic label of colic is defined by it's symptoms rather than a particular cause. It is believed to affect about 25% of babies who exhibit uncontrollable crying over three hours a day and at least three days a week. This formula can be variable and any parent who has to regularly deal with an inconsolable, screaming baby, many days in a row, whether the 3 hour mark is met or not, would be termed by their pediatrician as having a colicky baby. With about 4 million babies born every year in the United States, this means that about a million babies, and everyone around them, are affected negatively by what appears to be inconsolable crying. In general, babies start exhibiting colic symptoms around three weeks of age, with it being at it's worst stage at around six weeks of age and then usually stopping around three or four months of age. Even though it is a relatively short time period in your baby's life, that three or four months will seem like years to the parents who have to "deal" with their baby screaming. If you have a baby with colic, you are bound to feel isolated, stressed and helpless to do anything that helps your baby. I know you do. You see, I am a colic veteran. In March of '97, I was blessed with a beautiful baby girl who was very colicky until she was 6 months old. Six months of endless nights of screaming and tears for all involved. About three years later, I was once again blessed with a wonderful child and he decided to follow in his sister's footsteps. He was a colicky as well. It is my hope to provide the stressed and helpless moms and dads out there dealing with colic, a place to receive support and understanding for one of the most trying times in your and your baby's relationship. When you have a colicky baby, the feelings you have will leave you feeling inadequate as a parent. You are not to blame for your baby's inability to calm down. You are not a bad parent because you can not stop the crying. Even the "I wish I never had this baby" thoughts are totally understandable and normal. Know that you are doing the best you can to cope. Coming to this site will hopefully reassure you that what you are doing and feeling are okay in the face of immense stress. Studies show that the colic crying can be dramatically decreased with the use of the probiotic strain, L. reuteri Protectis. BioGaia contains this strain. 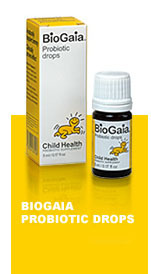 The probiotics have been tested and proven safe and effective for use in infants, older children and adults. A study published in the medical journal, Pediatrics, showed that, at the 28 day mark of taking the probiotics, the average crying time had decreased from 159 minutes a day to 51 minutes a day and that 95% of the study participants had significant improvement in crying time.